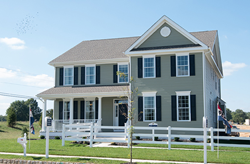 The award-winning community in Old York Village offers new homes affordably priced from the low $400s. Traditions at Chesterfield, an award-winning community within the 500-acre Old York Village, offers new single-family homes from the low $400s. “Stop by our open house weekend to learn more about our quick delivery homes. This is a really great opportunity for those looking to settle into a new home right away,” said Paul Csik, Senior Vice President for American Properties Realty, Inc.
Save a little green during Traditions at Chesterfield’s Open House Weekends on Saturday, March 9th to Sunday, March 10th and March 16th to March 17th from 11am to 4pm daily. Traditions at Chesterfield, an award-winning community within the 500-acre Old York Village in Chesterfield, offers new single-family homes affordably priced from the low $400s. Low home prices in combination with historically low interest rates make now the ideal time to purchase a new home at Traditions at Chesterfield. New homes at Traditions at Chesterfield come with a 10-year new home warranty and feature up to 3,549 sq. ft. of living space with three- to four-bedrooms, a two-car garage and basement. “These homes are perfect for entertaining and offer spacious family rooms and living rooms with world-class appointments,” Csik added.